Minnesota has been receiving well-deserved attention for its ambitious renewable energy and greenhouse gas reduction goals, which aim for 25% of electricity from renewables by 2025 and an 80% reduction in GHG emissions by 2050. Indeed, its largest utility, Xcel Energy announced plans earlier this month to reduce carbon emissions by 80% from 2005 levels by 2030, and completely eliminate carbon emissions from its power plants by 2050. While renewable energy is the ‘showhorse’ most talked about regarding Minnesota’s efforts, energy efficiency will be a key ‘workhorse’ in achieving those clean energy goals. After all, any such goals (e.g., renewables % or GHG reduction) become easier if energy efficiency reduces the amount of energy required. Minnesota has long been among the national leaders in utility energy efficiency, which has helped enable its noteworthy renewable energy accomplishments to date. Now a new energy efficiency potential study shows that much more opportunity remains for energy efficiency in Minnesota, which should help pave the way for further progress toward renewable energy and climate goals. The study was coordinated by the Minnesota Center for Energy and Environment (MNCEE), with project partners Optimal Energy and Seventhwave, and assistance from ACEEE and ESource. The graph below helps put those savings in context. 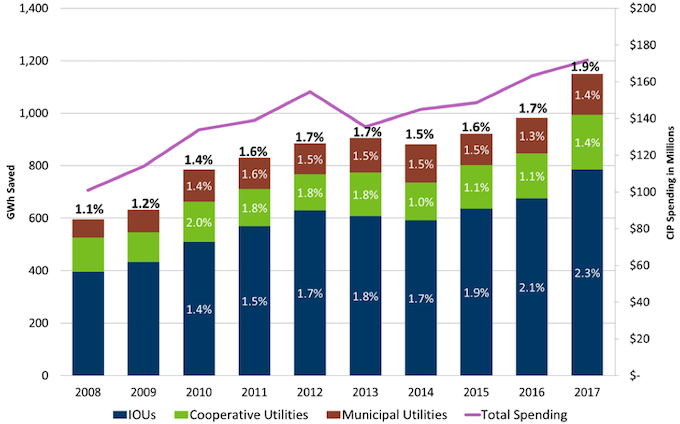 Excerpted from the final report, it shows the historical energy efficiency spending and savings achievements of Minnesota electric utilities (in gigawatt-hours and as a percentage of total sales), for each year since 2008. Achieving the study’s identified savings would be a major contribution toward meeting future renewable energy and greenhouse gas reduction goals. Moreover, utility energy efficiency programs provide considerable economic benefits. Minnesota has reported that such programs have returned four dollars to the state’s economy for every one dollar spent on them. Net benefits over one six-year period totaled approximately $3.3 billion. Another key take-away from the study results is that even a state with a long history of aggressive energy efficiency programs still has large remaining cost-effective and achievable energy efficiency potential, albeit with an evolving mix of measures and programs, as the study describes. In keeping with Minnesota tradition, the study featured an extensive stakeholder process, in which interested parties from a variety of perspectives were able to participate. Discussions focused not only on the study’s technical aspects, but also on the associated policy implications. Credit goes to MNCEE for managing the 20-month project, and to the Minnesota Commerce Department, Conservation Applied Research and Development Program, for providing the funding for this project. In addition to the full written report (available now), a webinar recording on the study results should be available soon on the MNCEE web site. One final observation is that Minnesota’s overall policy approach exemplifies the strategy of combining energy efficiency and renewable energy into an overall clean energy agenda. While some states tend to excel at one or the other, Minnesota is aggressively pursuing both components. We salute those efforts and hope for continued success.